To better understand how knee problems occur, it is important to understand some of the anatomy of the knee joint and how the parts of the knee work together to maintain normal function. First, we will define some common anatomic terms as they relate to the knee. This will make it clearer as we talk about the structures later. Many parts of the body have duplicates. So it is common to describe parts of the body using terms that define where the part is in relation to an imaginary line drawn through the middle of the body. For example, medial means closer to the midline. So the medial side of the knee is the side that is closest to the other knee. The lateral side of the knee is the side that is away from the other knee. Structures on the medial side usually have medial as part of their name, such as the medial meniscus. 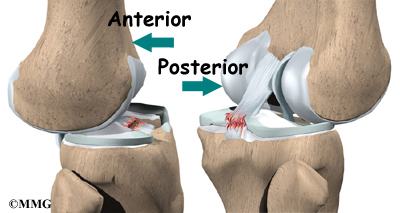 The term anterior refers to the front of the knee, while the term posterior refers to the back of the knee. So the anterior cruciate ligament is in front of the posterior cruciate ligament. The knee is the meeting place of two important bones in the leg, the femur (the thighbone) and the tibia (the shinbone). The patella (or kneecap, as it is commonly called) is made of bone and sits in front of the knee. The knee joint is a synovial joint. Synovial joints are enclosed by a ligament capsule and contain a fluid, called synovium, that lubricates the joint. The end of the femur joins the top of the tibia to create the knee joint. Two round knobs called femoral condyles are found on the end of the femur. These condyles rest on the top surface of the tibia. This surface is called the tibial plateau. The outside half (farthest away from the other knee) is called the lateral tibial plateau, and the inside half (closest to the other knee) is called the medial tibial plateau. The patella glides through a special groove formed by the two femoral condyles called the patellofemoral groove. The smaller bone of the lower leg, the fibula, never really enters the knee joint. It does have a small joint that connects it to the side of the tibia. This joint normally moves very little. Articular cartilage is the material that covers the ends of the bones of any joint. This material is about one-quarter of an inch thick in most large joints. It is white and shiny with a rubbery consistency. Articular cartilage is a slippery substance that allows the surfaces to slide against one another without damage to either surface. The function of articular cartilage is to absorb shock and provide an extremely smooth surface to facilitate motion. We have articular cartilage essentially everywhere that two bony surfaces move against one another, or articulate. In the knee, articular cartilage covers the ends of the femur, the top of the tibia, and the back of the patella. Ligaments are tough bands of tissue that connect the ends of bones together. 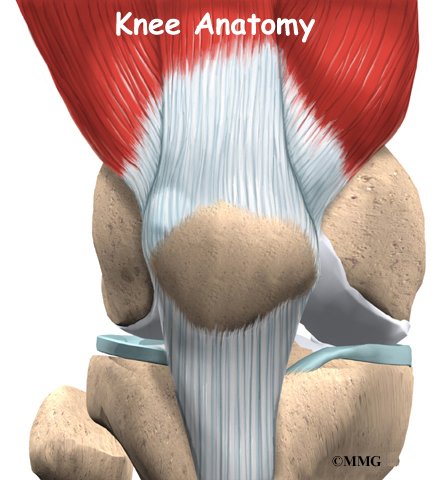 Two important ligaments are found on either side of the knee joint. 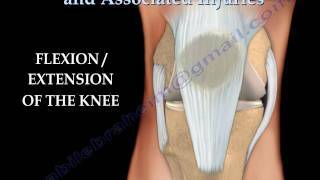 They are the medial collateral ligament (MCL) and the lateral collateral ligament (LCL). Inside the knee joint, two other important ligaments stretch between the femur and the tibia: the anterior cruciate ligament (ACL) in front, and the posterior cruciate ligament (PCL) in back. The MCL and LCL prevent the knee from moving too far in the side-to-side direction. The ACL and PCL control the front-to-back motion of the knee joint. 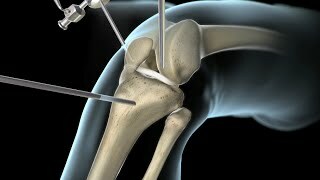 The ACL keeps the tibia from sliding too far forward in relation to the femur. The PCL keeps the tibia from sliding too far backward in relation to the femur. Working together, the two cruciate ligaments control the back-and-forth motion of the knee. 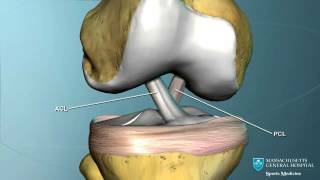 The ligaments, all taken together, are the most important structures controlling stability of the knee. Two special types of ligaments called menisci sit between the femur and the tibia. These structures are sometimes referred to as the cartilage of the knee, but the menisci differ from the articular cartilage that covers the surface of the joint. The two menisci of the knee are important for two reasons: (1) they work like a gasket to spread the force from the weight of the body over a larger area, and (2) they help the ligaments with stability of the knee. Imagine the knee as a ball resting on a flat plate. The ball is the end of the thighbone as it enters the joint, and the plate is the top of the shinbone. The menisci actually wrap around the round end of the upper bone to fill the space between it and the flat shinbone. The menisci act like a gasket, helping to distribute the weight from the femur to the tibia. Without the menisci, any weight on the femur will be concentrated to one point on the tibia. But with the menisci, weight is spread out across the tibial surface. Weight distribution by the menisci is important because it protects the articular cartilage on the ends of the bones from excessive forces. 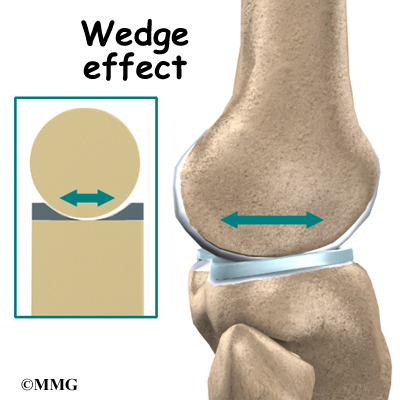 Without the menisci, the concentration of force into a small area on the articular cartilage can damage the surface, leading to degeneration over time. In addition to protecting the articular cartilage, the menisci help the ligaments with stability of the knee. The menisci make the knee joint more stable by acting like a wedge set against the bottom of a car tire. The menisci are thicker around the outside, and this thickness helps keep the round femur from rolling on the flat tibia. The menisci convert the tibial surface into a shallow socket. A socket is more stable and more efficient at transmitting the weight from the upper body than a round ball on a flat plate. The menisci enhance the stability of the knee and protect the articular cartilage from excessive concentration of force. Taken all together, the ligaments of the knee are the most important structures that stabilize the joint. Remember, ligaments connect bones to bones. Without strong, tight ligaments to connect the femur to the tibia, the knee joint would be too loose. Unlike other joints in the body, the knee joint lacks a stable bony configuration. 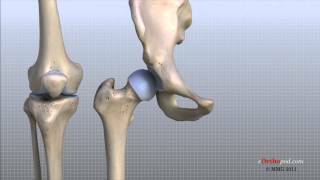 The hip joint, for example, is a ball that sits inside a deep socket. The ankle joint has a shape similar to a mortise and tenon, a way of joining wood used by craftsmen for centuries. Tendons are similar to ligaments, except that tendons attach muscles to bones. 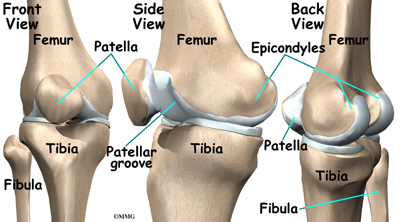 The largest tendon around the knee is the patellar tendon. This tendon connects the patella (kneecap) to the tibia. This tendon covers the patella and continues up the thigh. There it is called the quadriceps tendon since it attaches to the quadriceps muscles in the front of the thigh. The hamstring muscles on the back of the leg also have tendons that attach in different places around the knee joint. These tendons are sometimes used as tendon grafts to replace torn ligaments in the knee. The extensor mechanism is the motor that drives the knee joint and allows us to walk. It sits in front of the knee joint and is made up of the patella, the patellar tendon, the quadriceps tendon, and the quadriceps muscles. The four quadriceps muscles in front of the thigh are the muscles that attach to the quadriceps tendon. When these muscles contract, they straighten the knee joint, such as when you get up from a squatting position. The way in which the kneecap fits into the patellofemoral groove on the front of the femur and slides as the knee bends can affect the overall function of the knee. The patella works like a fulcrum, increasing the force exerted by the quadriceps muscles as the knee straightens. When the quadriceps muscles contract, the knee straightens. The hamstring muscles are the muscles in the back of the knee and thigh. When these muscles contract, the knee bends. The most important nerve around the knee is the popliteal nerve in the back of the knee. This large nerve travels to the lower leg and foot, supplying sensation and muscle control. The nerve splits just above the knee to form the tibial nerve and the peroneal nerve. The tibial nerve continues down the back of the leg while the peroneal nerve travels around the outside of the knee and down the front of the leg to the foot. Both of these nerves can be damaged by injuries around the knee. The major blood vessels around the knee travel with the popliteal nerve down the back of the leg. The popliteal artery and popliteal vein are the largest blood supply to the leg and foot. If the popliteal artery is damaged beyond repair, it is very likely the leg will not be able to survive. The popliteal artery carries blood to the leg and foot. The popliteal vein carries blood back to the heart. The knee has a somewhat unstable design. Yet it must support the body's full weight when standing, and much more than that during walking or running. So it's not surprising that knee problems are a fairly common complaint among people of all ages. Understanding the basic parts of the knee can help you better understand what happens when knee problems occur. Have something you want to discuss, tips to share or a question to ask? Join the Knee Discussion Group!